Simon Crean, Minister for Trade, (God help us all) was back on ABC Radio's PM program tonight, complaining about the failings of "This Government". Wake up Simon. You were actually complaining about the Previous Government. Learn your lines, Mate!. Its not that hard. Call them "the Howard Government", or even "our incompetent predecessors". But do learn that THEY are no longer "THE GOVERNMENT". For Heaven's sake, get it right. I know Simon is stuck in the past, but he needs to get over his obsessive hatred, or at least re-train his tongue (IF HE CAN!). Personally I doubt he can manage that task, and ought never have been given another chance in the Ministry. Ambassador to the ILO would be good posting, surely? I wonder how soon that job is due to be filled? Oh, and why was he appointed to a Ministry? Here's a clue - a cartoon which I published on a now-deleted blog site. 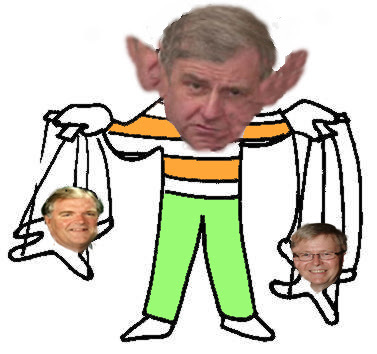 Clearly the issue was Crean's support of Rudd for the leadership, over Kim Beazley, who Crean had despised for a number of years. So - the answer to why he was appointed is simple - the payment of a political debt. And for a brief memory refresher on Crean's faction war history, and his bitter battle for pre-selection in his own seat of Hotham, have a look at this interview from the Sunday Program from 5 March 2006. My how the world has changed - in Simon Crean's favour, in the last 20 months. No wonder Crean seemed to enjoy the swearing in ceremony more than anyone else, the other day. And today I learn he is the first of the Rudd Ministers to go on an overseas trip. It fits a pattern - one which I for one, do not wish to see repeated - an abuse of the privileges of offices.